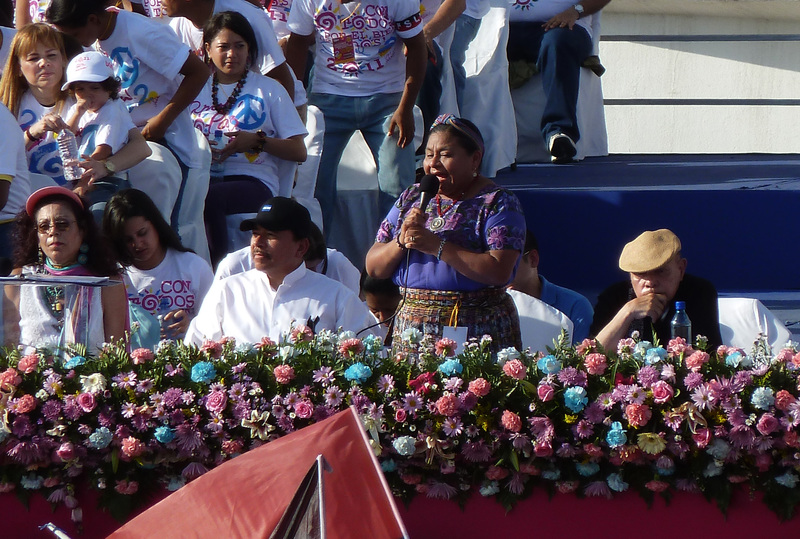 Also at the rally on Tuesday was Guatemalan writer and indigenous rights activist, Rigoberta Menchú. She spoke to the hundreds of thousands gathered. She paid homage to “the inspiration that the Nicaraguan Revolution had given to the peoples of Latin America”. The Nobel Prize winner said that the Revolution and the Nicaraguan people’s struggle “is also our revolution, it is also our struggle”. Highlighting the progressive social and political changes in Latin America over the past ten years she called upon Nicaraguans and Latin Americans to continue constructing a ‘new world’ and declared, “we want to acheive freedom for the poor, the illiterate, for all the world’s people still living under oppression, injustice and inequality”. The contrast with other Central American countries is stark. For El Salvador, Honduras and Guatemala, the US funded hell of the 1980s conflict has never gone away. Indeed, in El Salvador and Guatemala, the yearly murder rate is comparable with that endured by the populations during the Civil Wars, the cost of which Rigoberta knows from personal experience. These countries are caught up in a conflict fuelled by drug trafficking, something analysed recently on UpsideDown World. The conflicts, though, run to the heart of the socieites. Whilst on the surface they appear to be about the control of drug trafficking, in reality they are about the issues highlighted by Rigoberta in her Managua speech – oppression, injustice and inequality. Last week Monica Baltodano condemned the Sandinista government for promoting ‘savage capitalism’. Whilst no one would claim that Nicaragua is a workers heaven, their condition is a world away from Guatamala. In Rigoberta’s homeland capitalism is red in tooth and claw. The litany of trade unionists slaughtered in Guatemala has been detailed by the ITUC (see here). Even the US State Department sees Guatemala out of control. Without addressing the regular assassinations of trade unionists, environmentalists and community leaders, it still manages to paint a picture of rampant killings and torture of individuals, many carried out by officers or former officers of the police and security forces (see here). Over the past couple of months SITRABI (the banana workers’ trade union in the Izabal region) has once again been hard hit by the armed repression of which male and female defenders of union rights in Guatemala are regular victims. Idar Joel Hernandez Godoy, treasurer of the central executive committee of SITRABI, was gunned down in cold blood on May 26, less than two months after the murder of another of his comrades, Oscar González Vázquez. SITRABI is calling for international solidarity as they demand justice. You can add your name to those taking actions here. For the second time in a month President Daniel Ortega has brought up the 1986 International Court of Justice ruling against the United States and in favour of Nicaragua. At yesterday’s 32nd anniversary celebrations of the Sandinista Revolution, Ortega called for a national referendum to demand that the US pay damages for funding the contras and mining Nicaragua’s harbours. Three weeks ago Ortega reminded Nicaraguans that an estimated $17billion in damages could be claimed from the US if Nicaragua chose to return to the decision of the Court (see our original post here). A ‘yes’ vote in a referendum would be a no-brainer for all but the most bitter of Ortega’s political opponents (the majority of which boycotted yesterdays celebrations). It would also do no harm to Ortega’s poll ratings ahead of November’s Presidential elections where he looks increasingly likely to chalk up a convincing victory. Some say the FSLN may even achieve the coveted majority in the National Assembly. However, to see this latest broadside against the United States as just another astute political manoeuvre by Ortega is also to miss the point. The issue is fundamentally one of justice. The court ruled that the United States had violated international law in funding and arming the contras as well as laying mines in Nicaragua’s harbours. But what did this mean in reality? Why all the fuss over something that happened over 25 years ago? “Western military analysts say the contras have been stashing tons of newly dropped weapons lately while trying to avoid heavy combat… Meanwhile, they have stepped up attacks on easy government targets like the La Patriota farm cooperative…, where several militiamen, an elderly woman and her year-old grandson died in a pre-dawn shelling.” To select virtually at random from the many cases deemed unworthy of notice, on November 2, 1987, 150 Contras attacked two villages in the southern province of Rio San Juan with 88-mm mortars and rocket-propelled grenades, killing six children and six adults and injuring 30 others. Even cooperatives of religious pacifists who refused to bear arms were destroyed by the US terrorist forces. I had no food, no clothes, nothing. The co-operative had been destroyed. Most of all, our dreams and hopes and projects had been smashed. So many years of struggle reduced to ashes. I was alone, without my husband, without my daughter and with my heart broken into a thousand pieces. I was so alone. I didn’t know what to do, where to turn. There are many, many ‘Tinas’ in Nicaragua. And yet the outgoing US Ambassador says that ‘the case is closed’, that anyway, in 1991 the Chamorro government renounced any claim to damages and that the US has, in a way, paid compensation to Nicaragua in the form of US government aid – amounting to ‘at least $2billion since 1990’. As anyone familiar with the way US aid is spent in Nicaragua might ask – what use to Tina is a brand new SUV bought for a State Department employee? What use to Tina is a fat salary paid to a US government official? What use to Tina is USAID money spent on funding the political campaigns of the right-wing opposition parties? Because these are the places where that money goes. And the answer, of course, is ‘no use whatsoever’. And what of the decision by the Chamorro government to ‘waive’ the right of Nicaraguans to seek compensation? Well, it would be rather odd for a US-funded government to pursue a claim for damages against the US wouldn’t it? Tina deserves justice. Jose Angel deserves justice. Zunilda deserves justice. Javier Perez deserves justice. And so do thousands of others whose lives were shattered or cruelly taken away during those dark years. There has been a total of $325.6m in interest payments on these bonds. This is the equivalent of 19% of Nicaragua’s GDP. Or 58% of the health budget or 40% of the education budget. the remnant of the most complex cases – former members of Somoza’s National Guard. Only 15 of these are actually US born. The others are those who went to Miami at the time of the revolution…Some are implicated in the killing of [US journalist] Bill Stewart. Some of them were torturers who had tortured the current Nicaraguan foreign minister and other Sandinistas. These cases are not worthy. They were not US citizens when this property belonged to them, they were Nicaraguan citizens. Why does the US government pick up the cause of people who’s claims are made about property when they were Nicaraguan citizens? The US government is supporting the false claims of assassins and torturers. The compensation issue is a matter of justice. Nicaragua is the second poorest country in the Western Hemisphere. US-backed dictators bled the country dry, a US-backed terrorist group massacred tens of thousands of Nicaraguans and brought the country to it’s knees, US-backed governments sold off Nicaragua’s assets and embezzled tens of millions of dollars. Isn’t it now time for the US to back off and pay up? 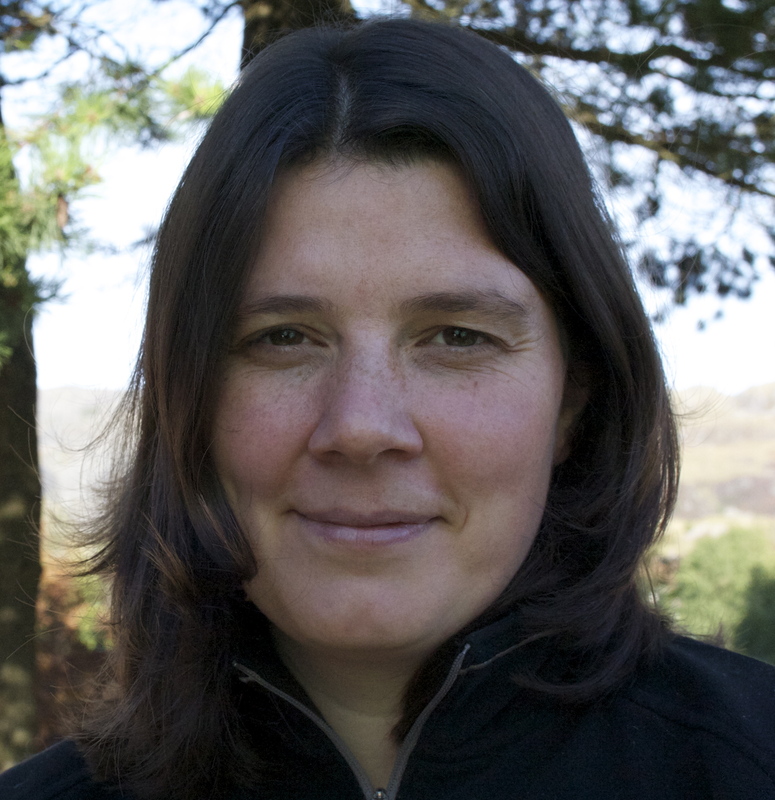 Bydd Sara Ashton yn siarad yng nghyfarfod yn Steddfod Wrecsam, Dydd Mercher, Awst 3, 3.30, ym Mhabell Cymdeithasau 2. Isod mae hi’n disgrifio ei phrofiad o fyw a gweithio yn Nicaragua, a’r dylanwad ar ei gwaith a bywyd. Pe bae dylanwad cymdeithas ar unigolion, a dylanwad unigolion ar y gymdeithas hynny yn cael ei gofnodi fel cyfrif banc. Byddwn mewn dyled aruthrol. Yn arbennig lle mae Nicaragua yn y cwestiwn. Pan oeddwn yn ysgrifennu’n diolchiadau i’w cynnwys yn du blaen fy nofel ‘Mari Wyn’, diolch gwnes i i rheini oedd wedi helpu’n uniongyrchol gyda’r broses sgwennu. Dim ond wedyn, ar ôl imi holi Ben os oedd modd sgwennu erthygl am y llyfr i gylchlythyr yr ymgyrch (gan y byddwn yn meddwl y buasech chi fel aelodau’r ymgyrch gyda diddordeb ynddo! ), wnes i sylweddoli faint oeddwn angen diolch i bobl Nicaragua am eu cyfraniad nhw tuag at y broses o ffurfio syniadau ar gyfer y llyfr hefyd. Gwnaeth hynny, yn ei dro, fy arwain i feddwl am faint o ddylanwad mae Nicaragua wedi cael ar fy mywyd yn gyffredinol ac ar yr holl bethau dwi wedi ac yn eu gwneud. Gwnaeth byw yno gwneud imi sylweddoli pa mor anodd mae bywyd yn gallu bod. Yn enwedig os ydy rhywun yn byw mewn cynefin ymylol (sy’n cael ei wthio mwy mwy tuag at yr ymylon gan gynhesu byd eang, a phrinder adnoddau) dan system economaidd sy’n atal i rywun gwarchod ac elwa, yng ngwir ystyr y gair, o’r cynefin hwnnw. Gwnaeth neud imi sylweddoli bod fy null o fyw yng Nghymru a’r systemau economaidd, cymdeithasol a gwleidyddol mae hynny’n parhau, yn atal fy ffrindiau yn Nicaragua rhag byw, mewn rhai achosion, heb sôn am fyw’n gyfforddus. Gwnaeth neud imi sylweddoli nad oedd gosod ambell i fwlb ynni isel, er yn beth pwysig i’w wneud, yn ddigon. Gwnaeth neud imi sylweddoli, os oeddwn am alw fy hun yn ffrind i’r bobl ‘ma, fod rhaid imi wneud popeth o fewn fy ngallu, fel y maen nhw eu hunain yn gwneud, er mor anodd yw eu bywydau bob dydd, i, yn y bôn, newid y byd. Gwnaeth neud imi sylweddoli, os oeddwn am wneud hynny byddwn yn gorfod derbyn fod bywyd fi’n hun, a bywydau eraill o fewn fy nghymdeithas yn gorfod bod yn llai cyfforddus. Ar ochr arall y geiniog, gwnaeth byw yno dangos imi’r pŵer sydd gan bobl gyffredin o bob math i newid y byd wrth gydweithio i oroesi a ffynnu. Fedrai’m disgrifio’r wefr o ryw fath o ryddid a gefais wrth eistedd ar do bws am 5 o’r gloch y bore, yn hyrtlan trwy’r cefn gwlad, yn gweiddi canu ‘Juntos unidos jamas seran vencidos’ ar y ffordd i ddathliadau pen-blwydd y chwyldro’n 19 ac wedyn yn 20. Yr un wefr a deimlais wrth fynychu protestiadau anferthol Jiwbilî 2000 yn Llundain a’r G8 yn Genoa, yn ogystal â phrotestiadau llai o amgylch Cymru a Lloegr. 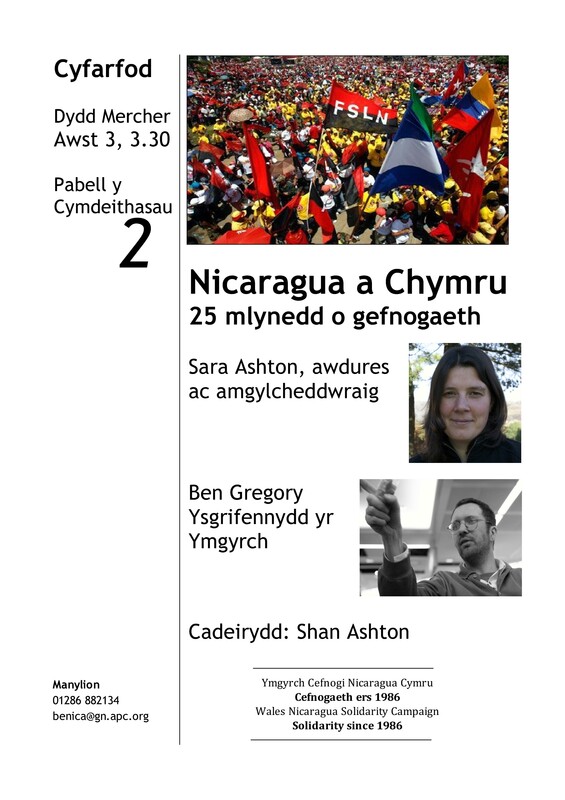 Dim bod canlyniadau ymgyrch y chwyldro yn Nicaragua’n berffaith, na chwaith yr ymgyrchoedd dwi wedi bod yn rhan ohonyn nhw. Does ‘na’r un newid cymdeithasol yn berffaith, sŵn i ddim yn meddwl. Ond mae’r gobaith sy’n ynghlwm a’r broses o ymgyrchu a cheisio newid cymdeithas yr un mor bwysig â’r canlyniadau yn fy marn i. Oherwydd y gobaith hynny sy’n ein galluogi ni i weledigaethu realiti gwell, i fentro dychmygu ei fod yn bosib. Sy’n dod a fi i’r trydydd peth, ac efallai’r peth mwyaf pwysig, wnaeth bobl Nicaragua dysgu imi. Unwaith mae rhywun wedi teimlo’r gobaith hynny ac wedi cael cip ar ddyfodol gwell, ni ddaw’r chwyldro byth i ben. Mae ‘na fodd ei weithredu bob dydd, a thrwy bob gweithred a wna rhywun. Mae’r gweithredu a chaiff ei wireddu ledled y wlad hyd heddiw’n dyst i hynny. Dydy chwyldro ddim yn rhestr o bethau i gyflawni fel y gall rhywun ei arfarnu a datgan ei lwyddiant neu beidio. Mae’n gylchdro o brosesau cymdeithasol, gwleidyddol, emosiynol, ysbrydol a ffisegol. Prosesau sy’n cyfrannu tuag at les, yn ystyr ehangaf y gair, y ddaear a’i thrigolion. Nid cael gwared ar rywbeth drwg mo’r ‘chwyldro’ ond adeiladu rhywbeth da. Dim bod gwneud hynny’n hawdd. Mae darllen ‘The Country Under My Skin’ gan Gioconda Belli a oedd yn rhan o’r chwyldro yn y 70au ac wedyn, yn fy atgoffa o eni babi (penderfyniad, cadernid, nerth a dyfalbarhad yw’r geiriau sy’n dod i’r meddwl, yn ogystal â synnwyr digrifwch wrth gwrs!). Ond mae o’n bosib. Wrth sgwennu hyn rŵan dwi wedi sylweddoli na ddylwn i wedi dim ond diolch i bobl Nicaragua yn y llyfr ond ei gyflwyno iddynt. Caiff y nofel ei grynhoi ar gefn y llyfr fel y ganlyn: ‘Hanes hogan fach yn dod i ddeall y byd a’i bethau yw hon. Ond mae taith Mari Wyn yn cynrychioli llawer mwy na hynny hefyd. Wrth gymryd cip ar ddyfodol posib, cawn archwilio’r modd rydyn ni’n dewis byw ein bywydau heddiw, a gofyn a yw’r dewisiadau a wnawn ni yn rhai doeth…’. Mae wedi dod yn amlwg imi fod taith Mari yn y nofel yn adlewyrchiad o’r daith a fues arni wrth fyw a gweithio yn Nicaragua. Mae’r profiad cefais yno nid yn unig wedi cyfrannu tuag at ffurfio syniadau ar gyfer y nofel, mae wedi cyfrannu’n fawr iawn tuag at y ffordd dwi’n gweld y byd, a’r ffordd dwi’n ceisio byw fy mywyd. Dwi’n lwcus iawn felly, nad yw dylanwadau ar unigolion gan gymdeithas a dylanwadau unigolion ar y gymdeithas honno yn cael eu cofnodi fel cyfrif banc. Onid dyna sydd mor hyfryd am solidariaeth (sef sefyll ochr yn ochr â’n brodyr a chwiorydd wrth weithio tuag at well fyd), y ffaith nad oes modd cofnodi’r trosglwyddiad o ysbrydoliaeth rhwng un sawl a’r llall a’r gweithredu caiff ei wireddu yn sgil hynny. Y ffaith, hyd yn oed pe bae modd gwneud hynny, byddai’r sỳms byth yn adio’n gywir, achos yn yr ystod yma mae’r cyfanwaith yn fwy na chyfanswm y rhannau. Y ffaith fod, fel y dywedir Taid wrth Mari Wyn yn y nofel, ‘O’r holl rymoedd sydd yn gwneud gwell byd, does ‘na’r un mor anhepgorol, yr un mor rymus â gobaith.’ Y ffaith fod, fel y gweiddais o do bws unwaith, ‘Juntos unidos jamas seran vencidos!’. 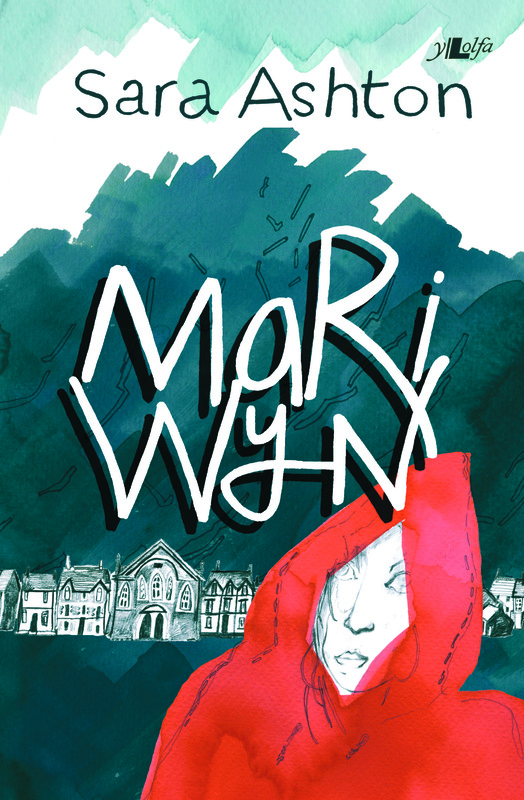 Cyhoeddwyd Mari Wyn gan Y Lolfa, mae modd ei brynu o’ch siop lyfrau Cymraeg lleol neu os nad oes un yn agos, dros y we. Mae 4ydd Gwyl El Sueno Existe ar y gweill, i gofio a dathlu cyfraniad Victor Jara at gerddoriaeth a gwleidyddiaeth Chile. Cynhelir yr Wyl ym Machynlleth ym mis Awst, gyda sesiynau trafodaeth gwleidyddol ar y dydd Gwener, a cheddoriaeth Cymreig a Rhyngwladol yn ystod gweddill y penwythnos. Am ragor o fanylion gweler fan hyn. The 4th El Sueno Existe festival is coming up, to remember and celebrate the contribution of Victor Jara to Chile’s music and politics. 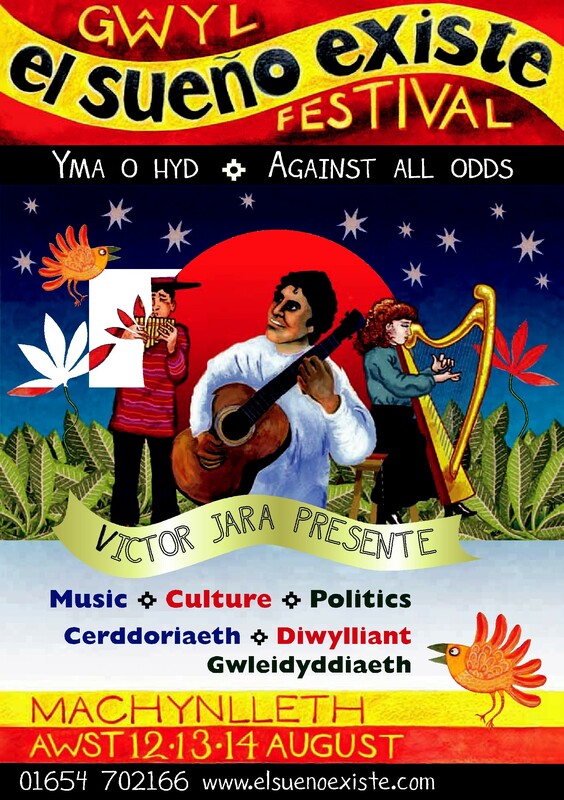 The festival is being held in August, with political discussions on the Friday, and Welsh and International music for the rest of the weekend. For more details see here. Solidarity organisations are often accused of seeing the world in black and white, particularly by those with the same mind-set and political convictions of Rory Carroll. MediaLens quickly published an analysis of the Carroll article, together with comments from Chomsky (see here). Chomsky says Carroll mis-represented him, by selective quotation and omission. The MediaLens piece includes the context of Chomsky’s remarks, together with comments contrasting the way the US imprisons people without trial (e.g. Bradley Manning). Chomsky also re-iterates his support for the achievements of the Bolivarian revolution. Carroll also quickly received a lambasting from Samuel Grove on alborada.net. Grove details Rory Carroll’s slack journalism over the years, his lack of impartiality, and the age old problem of many foreign correspondents, their laziness and inability to travel beyond the front door of their hotels or apartments. The case, though, does highlight something worth debating. How critical should supporters be of progressive governments, which by definition will be under threat from the forces of reaction, both inside the country and from without? Chomsky’s stance on Judge Afiuni would be expected from anyone familiar with his work. He combines a commitment to social justice with a belief in individual freedom, not unexpectedly from an anarchist. His letter about the Judge recalls a similar incident three years ago, when he wrote a letter of support for Dora Maria Tellez in Nicaragua, who was on hunger strike after steps were taken to remove the legal status of her party, the MRS. No one can doubt Dora Maria’s credentials – a genuinely heroic guerilla during the struggle against Somoza, and running an efficient and fairly corruption free Ministry of Health during the time of the Revolution. She also argued incessantly for greater democracy within the FSLN after they lost the elections, and left to form the MRS when she and others perceived that this didn’t happen. But inspite of this you have to question the political judgment of the leaders of the MRS, who have since thrown in their lot with the Right for the forthcoming elections – an alliance with Eduardo Montealegre – a journey which started with Tellez’ hunger strike. It is apparent that, for solidarity organisations, the context for criticism, or open discussion, of both the achievements and failings of progressive government in Latin America is different today than during, say, the period of the Sandinista revolution during the 80s. Then the FSLN demanded, and on the whole received, unconditional solidarity. One of the most heated discussions within the solidarity movement, certainly here in Wales, was how to respond to the banning of La Prensa. Certainly there was a case to be made for stopping its publication, not least its open support for the counter revolution (and how ironic that many who claim to support the ‘freedom of the press’ have little to say about Murdoch’s Fujimori style auto-coup, banning his own newspaper, the NoW, to draw attention away from his wobbling acquisition of BSkyB). But voices within the solidarity movement said the banning was wrong, and the way to deal with La Prensa was to develop alternative media. 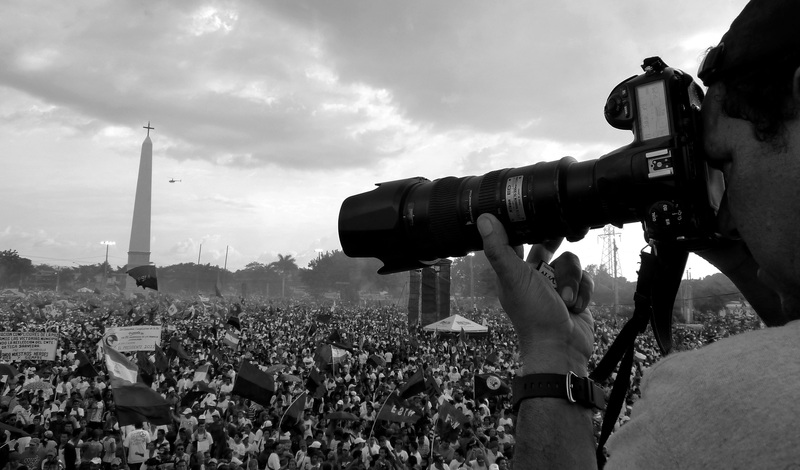 In fact, today La Prensa, El Nuevo Diario and most of the TV stations are equally hostile to the current Sandinista government, which has chosen the second course of action to deal with the constant negative stories in the media. And some of the FSLN’s most fiercest critics, who complain the government is trying to take over the media, are ex-Sandinistas who were prominent in developing an alternative media during the revolution. Contrast this supposed ‘dictatorship’ with events in Honduras, where journalist opponents of the illegitimate government are regular cut down by death squads. Solidarity organisations are often accused of seeing the world in black and white, particularly by those with the same mind-set and political convictions of Rory Carroll. In fact the Campaign, like many other organisations, sees no problem highlighting both the need for changes – such as in the banning of therapeutic abortion; the political realities – a minority FSLN government and in the case of abortion, the massive influence of the churches; and the achievements for women – the zero hunger and usury programmes, the gains in health and education. And the full transcript of Chomsky’s interview with Carroll also reflected this – the concern for Judge Afiuni, the lamentable record of the US government on the human rights of its own people and in Latin America, and the improvements in the lives of poor Venezuelans thanks to the policies of the Chavez government. It is the failure to present this complex picture by the likes of the Carroll and the Observer which is the true black and white vision. Perhaps it’s time for the owners of the Observer to consider the Murdoch option, and ban itself. Or at least replace Mr Carroll. Who are the biggest transgressors against democracy in the Americas today? Well, according to witnesses and members of the US Senate Foreign Relations Committee, Cuba, Venezuela and Nicaragua lead the field (see here for the Voice of America report). 1) In 2006 the ruling party’s candidate won in a fraudulent Presidential election. It has one of the highest rates of femicide in the world. It’s President launched a ‘war against drugs’, which so far has seen 35,000 people killed, without weakening the powers of the cartels. 2) In 2009 the President in this country was removed in a coup. Immediately after, widespread oppression was organised against trade unions, feminists, environmentalists and the media, including disappearances and killings. Presidential elections were then held under a state of siege to ‘restore democracy’. In 2010, under the restoration, it was the most dangerous country in the world to be a journalist, according to Reporters without Borders, with at least ten murdered. 3) In 2000 widespread electoral fraud was carried out across many of the constituencies, organised by electoral and judicial officials loyal to one of the candidates. The deciding votes came down to one state, where the fraud was supervised by the candidate’s brother. The new President then systematically misled his own Congress, leading to the invasion of a country which killed somewhere between half a million and a million people. And the countries? Well, unfortunately they were not on the US Senate Committee’s list – Mexico, Honduras, and the United States itself. But the US, and its junior partner, the UK, have always dealt in irony. The latest example is the unveiling today of a statue in London to remember the contribution of Ronald Reagan to democracy (see here for a briefing from our sister organistion, the Nicaragua Solidarity Campaign). The 250,000 victims of Reagan’s policy across Central America in the 80s would surely laugh at this Independence Day joke, except of course, they can’t.